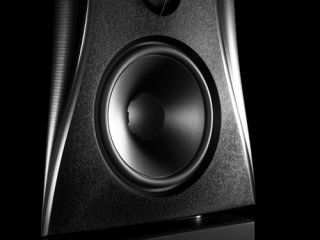 Dynaudio launches Evidence Platinum speakers | What Hi-Fi? Dynaudio's new flagship reference loudspeaker – the Evidence Platinum – has made its UK debut, two years after the first concept version was unveiled at the Munich High End Show. The Danish manufacturer has had its new flagship speaker in "continuous development" for nearly seven years, and its launch comes 12 years after the release of the Evidence Master. Standing 194cm tall and weighing 115kg, the £58,500 loudspeakers come with a range of features that Dynaudio has claimed offer the "pinnacle of company’s audiophile experience". Dynaudio Directivity Control (DDC) technology is designed to reduce the sound reflection from both floors and ceilings through the matching of phase responses of individual drive units. A specially designed crossover sits at the heart of DDC technology, which looks to achieve a perfect balance of frequency responses from the speaker's eight "precisely tuned" drive units. The diaphragms of the bass and mid-range units meanwhile are built from Magnesium Silicate Polymer that has low mass, high rigidity and what Dynaudio says is "ideal internal damping properties". Four 18cm woofers aim to provide a powerful bass response, which is further enhanced by the bass-reflex ports located on the back of the Evidence Platinum's cabinets. Other features include the Esotar2 with Precision Coating tweeters offering a frequency response of more than 25,000Hz, and a "resonance-deadening" 40mm aluminium front baffle.